Far from being the end of the world, the pain of the Great Recession caused by the housing bust will have long term beneficial effects on society — assuming we learn the right lessons. Just purse your lips and whistle — that's the thing! The fact that prices are falling is not a bad thing, not that loan owners who rely on HELOC income would agree. Financial market implosions purge irresponsible and unsustainable habits from the populace. HELOC dependency serves no one, not even the sheeple who got to enjoy it for a time. The unceremonious fall from entitlement is inevitable, and although the fall is emotionally devastating, getting off the HELOC heroin is better for borrowers in the long term. Falling prices bring affordability to the prudent who understand valuation and their cost of ownership. Many people have put off their purchases because they understand the power of rental parity. Those people will be rewarded with lower debts, and the ability to move without feeding a black hole on their family balance sheet. The lower debt service payments will benefit the local economy as money that used to go to a lender is now circulating in the local economy to buy goods and services. Anyone who has seen a friend kick an addiction — be it to alcohol, drugs or cigarettes — knows the extreme discomfort and force of will required. America has long suffered repeated bouts of binging on real estate. The booms inevitably trigger busts, one of which we're now in deep. But there is some bright side here. As they say, with pain comes gain. The collapse in house prices could help the environment, stabilize family finances and strengthen our economic base over the long term. True, the housing crash continues to drag down today's economy. Prices have fallen nearly 32 percent from their 2005 high, according to the Standard & Poor's Case-Shiller 20-city index. One in five Americans with a mortgage is “underwater.” That means these owners owe more on their home than the home can sell for. Economists expect house prices to rise only about 1 percent between now and 2015, leading some to call this a “lost decade” for homeowning. Housing woes are still the primary cause of our weak economy. An entire industry is sitting on the sidelines. Construction related unemployment is over 30%, and new home sales continue to set record lows. Realtors and mortgage brokers are similarly hurting as lower prices and lower transaction volumes have caused sales commissions to plummet. None of these industries is forecast to improve in the near term. What we really have is a return to certain realities obscured by the housing bubble. Ten years ago, soaring house prices created a “wealth effect.” This was an illusion of newfound prosperity, which prompted homeowners to borrow heavily off their rising equity and spend the money, much of it at the mall. Apparently, I am not the only one who noticed. You don't read much about rampant HELOC abuse in the mainstream media. They didn't save much for retirement, figuring that they could live off the proceeds from selling their home. i am always shocked when I read about the stupid things some people did to destroy their security in retirement. Shabby lending practices exploded, snaring many Americans who could not afford what they were buying into paycheck-to-paycheck existences or foreclosure. The only way out for many struggle families is strategic default. Those with the most financial distress have already walked away, but those who are barely getting by are continuing to hold on with hope that rising prices will give them equity again soon. Unfortunately for them, prices will fall, and even with the lower balance of an amortizing mortgage, many households will be years before they have equity again. When the music stopped, the wealth effect geared into reverse. Families pulled back on spending. They began to “de-leverage” their finances — that is, start paying off their debt. Construction workers, landscapers, salespeople and others living off the bubble lost their jobs. The resulting unemployment is troublesome, but won't the American economy become stronger when families start carefully investing for their future, rather than relying on the magic-mushroom “high” of ever-rising home prices? Isn't it better for the environment that prospective homebuyers now value smaller houses that use less energy, take up less space and are often located closer to work, schools and shopping? And isn't it good for American towns and cities where these smaller and older houses are located? Once rejected by status-conscious house hunters as “starter homes,” bungalows and capes are becoming the permanent and beloved family residences that they were a couple of generations ago. Neighborhoods populated mainly by older folks and unmarried hipsters now draw families with children, bringing new life to formerly struggling commercial centers. The housing bust in California has enabled many renters to buy properties closer in to employment centers. The commute through the valley on the 91 is no longer a necessary price to pay to have a nice house for many who work in Orange County. Speaking of which, the so-called lost decade for homeowners has become a “found decade” for homebuyers. Young people can easily find far more affordable housing, although getting a mortgage has become tougher. They don't have start off their working lives drowning in debt. The mainstream media is so caught up in the distress of loan owners that they completely fail to mention the benefits current buyers are obtaining. For the first time in a decade, people are able to buy houses with a lower cost of ownership than a comparable rental. One must feel for the homeowners who now owe more on their mortgages than their homes' value. Some borrowed recklessly, but many just got caught up in a frenzy whipped by powerful interests. The real-estate industry peddled homes as no-lose investments. Deregulated lenders became debt pushers (while passing the risks onto others). The Federal Reserve sustained the market's boil by keeping interest rates very low, with the Fed chairman himself dismissing the manic speculation as “froth.” The boom-bust cycle in real estate has repeated itself so often in our history that it would be foolish to declare the housing addiction “cured.” We are, after all, a land of bounteous acreage and a certain grandiosity when it comes to the material. But since this latest excess had to come to an ugly end, let's at least get something good out of it. It's natural for people to want free money. When a Ponzi virus is released into the financial system, it spreads because it's human nature to want something for nothing. People wanted house prices to continue to rise in order to fund their spending. People were willing to push prices every higher to obtain the free money that came from ownership. The system worked until the pipers stopped the music and demanded to get paid. The damage this Ponzi virus did to the US economy is evident in this recession that goes on and on. The government tells us the recession ended two years ago. Does it feel that way to you? It doesn't if you work in real estate. The Great Recession will finally end, and prosperity will return. When it does, I hope we have learned the lessons of history. So far, I haven't seen any of the causes of this debacle cured through preventative legislation. Our collective memories will only last so long, and when the Siren's song of free money beckons, the next Ponzi weed will find a fertile soil in which to germinate. The Irvine Housing Blog turned five years old yesterday. Welcome to the Irvine Housing Blog! This house has no kitchen. The previous owner must have ripped it out and sold it before moving on. The bank took this property back at the end of June and has no idea what to do with it. The strategy right now is to find an all-cash buyer who will put in their own kitchen. 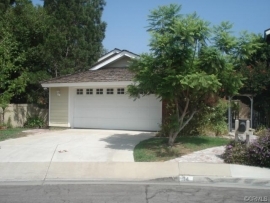 This all-cash buyer must be willing to pay $337/SF for a property which backs onto the the Culver/Warner intersection. This property might fetch $525,000 if the kitchen were in place, but nobody looking to profit on the flip would touch this place for $484,900, and given its inherent negatives, I don't foresee many all-cash owner occupants willing to buy this place. Either the bank is going to have to lower its price significantly, or they are going to have to spend the money to put in a kitchen and hope for the best. GREAT opportunity to own your piece of Woodbridge. Close to Northlake and many of the other association amenties, including one of their many parks, pools, sports courts etc!! Seller is contemplating repairs, send your CASH offers to get this price. .. 3 bedrooms and 2 baths, kitchen is ready for your personal touches and upgrades. 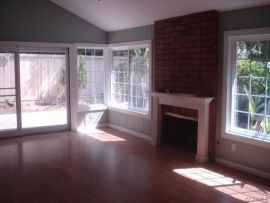 Brick fireplace in family room and sliding glass door to rear patio area. We still have seating available for tonight's presentations. I hope to see you at the offices of Intercap Lending (9401 Jeronimo, Suite 200, Irvine, CA 92618). You may still attend if you have not provided an RSVP; however, if the crowd is too large, you may have to stand in the back. This entry was posted in Library, News on September 28, 2011 by IrvineRenter. I totally agree because it takes assets out of weak hands (we got many in OC), and places them in strong hands. However, we have a government and Federal Reserve hellbent on preventing the housing bust. They can’t prevent the inevitable from happening, they can only make the pain last longer, which is exactly what they are doing. My friend use to charge $500 at uni high for this service. Guess it’s more prevalent than people think. That is probably the best realtor spin I’ve heard in a long time. I agree – I was sorely disappointed there wasn’t a picture of it! As long as the author does not forget that the ponzi was supplied by the bankers and driven by them, then this article makes sense. But without the bankers there would have been no ponzi. The bankers were Madoff multiplied thousands of times. If the author understands and shares this truth, then we won’t have folks like Ron Paul and Santelli blaming everyone but the bankers. You wonder who those guys really work for. Here we have Ron Paul, who says he is against speculation, who wants to repeal Dodd-Frank, now says he rejects Glass-Steagall, and who wants the speculators to run wild, all because of his libertarian religion. Paul had voted against the repeal of Glass-Steagall but now says he doesn’t want the law. But we need to stop the gamblers taking deposits and gambling with leverage! I guarantee you guys that the ponzi housing bubble will happen again. In my ebook, Dirty Dirty Republicans I show how the hedge fund world loves the Tea Party and Eric Cantor. And I show how the Tea Party leaders are getting money from the very hedge funds who facilitated the last housing bubble. And I show how they want to trash Dodd-Frank. Trust me, the banking community has learned nothing. Ron Paul voted against the Bankster bailout and wants to reign in the Federal reserve which is the tool of the banksters.He doesn’t get money from banks or hedge funds. But don’t worry. He has no chance of winning. He’s up against not only the banks but the military industrial complex as well as powerful unions. the American people are going to get what they deserve. Just renewed the lease with zero rent increase! So glad that once in a while good behavior gets rewarded (in my case, being a good responsible tenant).